I was hungry . . . and it was your world. "I just can't fit" ... said another way ... He changed? ... She's not the same person ... I don't love him/her anymore. Broken dreams, broken promises, broken lives, and broken hearts follow. We just want to be seen, to matter ... to be heard ... to simply be. You just desperately want and need love ... both to give and receive. A return to the train station is in order ... to purchase a ticket to bliss. However, your fear of vulnerability and loneliness will cause you to find another relationship on the platform, the place where all doomed relationships start. In our desperate search for love and meaning, we learn to control our lives and manipulate our feelings and thoughts to mold that other person into the image we want to see; the image we need to see; the image we ... want to love. The other usually returns the favor for they are drinking the same cup. Two human beings trying to BE, both looking for the blessing from somewhere; perhaps a little laughter, some tears, and a tender moment here or there, someone to hear a heart, a dream, a moment to share, a sunset or glass of wine. Friends, you will not find your friend, lover, or soul-ally on a train platform. Why? You find your rich relationships on the journey through the shared common experiences of life. This happens on the train ... on the journey. Stop making your relationship decisions on the platform, before you have ever boarded your own train. You don't even know where you are going and neither does your potential lover who you are dancing with on the platform. You do not need anyone else to take your journey. 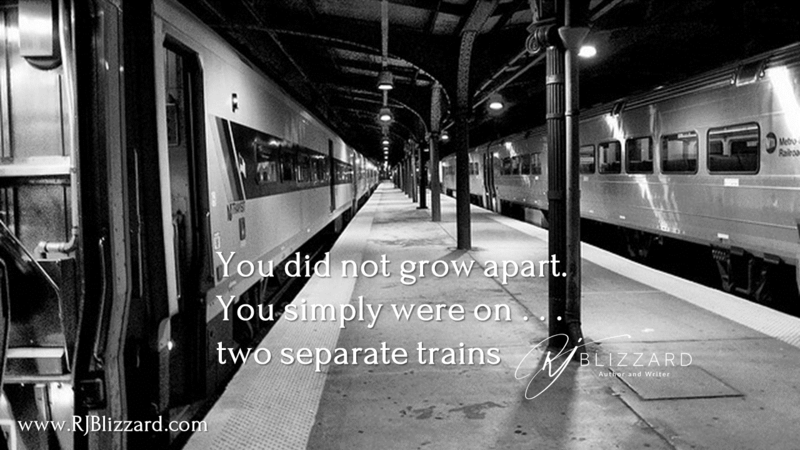 Get on the train, and it will be there, you will find your meaningful relationships. You will meet someone who is living in your life experience, a sojourner of like souls who can be your friend and lover. You cannot find love... it finds you. That is how God works, that is how life is designed; it is how He works to save us from ourselves. Relationship actually works naturally then, and is not forced, and is much less difficult. Notice, I did not say easy. The most significant relationship one can have is with God, and scripture describes it as not burdensome; that's a lot different than your Christian self-help books and seminars depict it. How come? So many people end up this way, hungry and it was your world. This leads to a life of frustrating negotiation. They started their life together on the train platform, then bought their tickets to .....Where?